Made a specimen based on Sanskrit grammar literature listed dhatupatha roots. 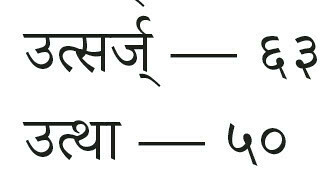 A pitty as Ulrich stated is has not some of the frequent Sanskrit ligatures. http://www.flickr.com/photos/gasyoun/ for more Devanagari scans and sreenshots. Eight years have passed since Ulrich published my font as his, but still I wanted clear a few misunderstandings. As the email mail.ru which I used for Sanskrit correspondence until gmail.com is now, I can not quote the text or dates, but it all was until 2005. After it Ulrich never replied. He was in contact with a colleague of mine from Minsk, Mihas, but now these days are over as well. In 2005 a .pdf was sent as a reply to my email from The Type Museum. Based on it I OCRed the text and sent it to colleagues. 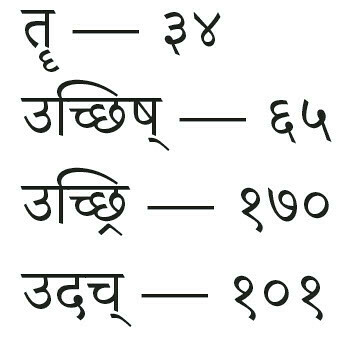 I was surprised to find it later at sanskritweb.net/itrans/s99fonts.pdf same year. Ulrich, haven written lots of interesting articles about font forgery, released a not yet ready font for public on his website, although he knew from our prior email exchange that I was involved and not only involved – the idea, scanning, drawing, improving was done in Moscow.